HAPPY CAT CAT-FREE WORKPLACE IF YOUR CAT LOVES TO SIT ON/IN - ProudMummy.com the Web's Community for Mums. 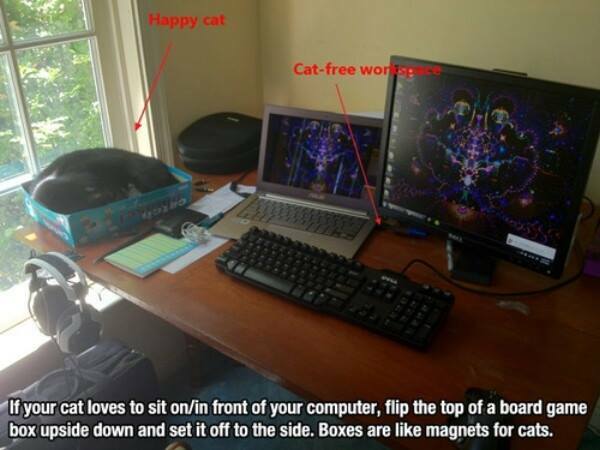 HAPPY CAT CAT-FREE WORKPLACE IF YOUR CAT LOVES TO SIT ON/IN FRONT OF YOUR COMPUTER, FLIP THE TOP OF A BOARD GAME BOX UPSIDE DOWN AND SET IT OFF TO THE SIDE. BOXES ARE LIKE MAGNETS FOR CATS.